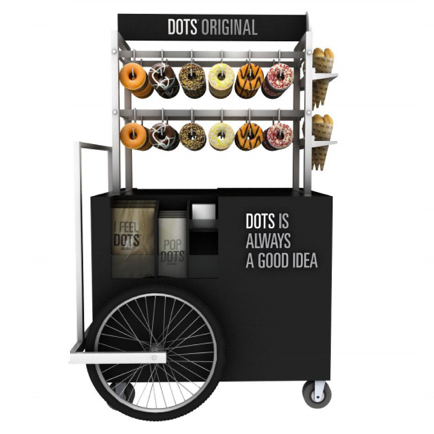 We are really excited to be taking delivery of our Dots Doughnut Cart next week. The products are proving extremely popular with customers and we can now use the doughnut cart for launches and special events. The cart will be unveiled for the first time at the Lunch Show next week, so do try and make it down to the Excel Centre in the docklands to see it. 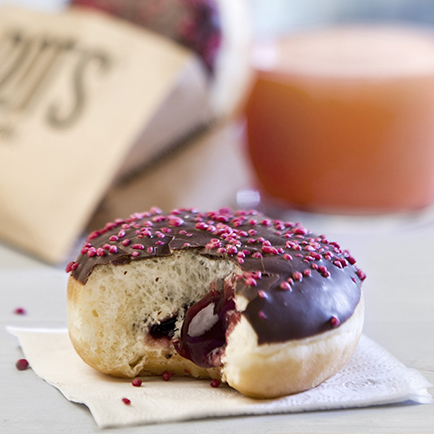 Dots offers the first branded doughnut concept aimed at the UK food service market and as we continues our love affair with these American sticky delights, the opportunity for the brand is huge. Evidence shows that the UK consumer, whilst being health conscious, is also extremely receptive to indulgent treats. The Dots brand is backed-up by a truly premium product. Each doughnut proof’s for around 50% longer than your average doughnut, this gives a wonderfully light and fluffy texture. The innovative decorations are eye-catching with a great range of fillings and styles. They are made using sustainable palm oil and contain no hydrogenated fats, preservatives or artificial colours. The doughnut cart is part of our range of POS material that includes a range of display units, posters, bags and take-away boxes.